HYDERABAD: National Crime Records Bureau (NCRB) director Ish Kumar on Thursday proposed that police be given “limited access” to Aadhaar data to help them trace first-time offenders and unidentified bodies. Kumar’s suggestion comes at a time when the Supreme Court is hearing a raft of pleas challenging the constitutional validity of Aadhaar on the ground that it violates citizens’ right to privacy. Speaking at the 19th All India Conference of Directors of Fingerprints Bureau here, the NCRB chief said nearly 50 lakh cases are registered across the country every year, adding that 80-85% of the offenders are first-timers without any police record. “Also, more than 40,000 unidentified bodies are found every year,” Kumar said. “With access to Aadhaar data, these (bodies) could be identified and handed over to their relatives,” he added. Junior minister (home) Hansraj Ahir said Kumar’s proposal would be discussed in the ministry along with amendments to the Identification of Prisoners Act. 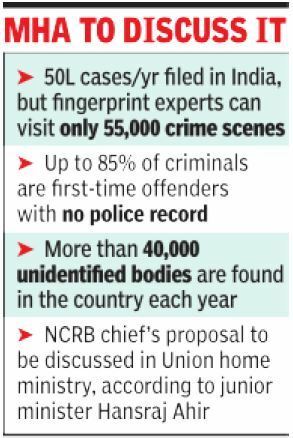 The NCRB director also stressed on the need to float a scheme to modernise all state fingerprint bureaus, so that experts could at least visit most crime scenes. “Though 50 lakh cases are registered across the country every year, fingerprint experts are able to visit only around 55,000 crime scenes. The reason is many states don’t have adequate fingerprint cadre strength nor do they have proper equipment and labs. Hence, there is an urgent need for the home ministry to float a scheme for modernisation of all fingerprint bureau from all states,” he said. M Mahendar Reddy, DGP of Telangana who attended the event, said automation of the fingerprint Identification process is a tool by which criminals can be identified more quickly and efficiently and AFIS has played a key role in investigation, virtually replacing traditional manual methods of fingerprint matching and classification. “Telangana is the first state to incorporate a palm print-based live scanner system for enrolment of criminal’s Fingerprints electronically and also deployed an Android-based single finger identification system to verify the criminal antecedents of a suspect in-the-field within seconds by the SHO himself without any manual intervention at Police station level,” he added. Altogether 868 undetected cases were solved since installation of Papillon AFIS, of which 480 cases were old unsolved scene-of-crime cases that were not identified by the older FACTS system. Minister of State (Home Affairs) Hansraj Gangaram Ahir, said the fingerprints being the scientific evidence, it decreases crime rate and increases conviction rate and its accepted by the court and society. If the conviction rate increases, the offenders and people who intend to do crime will have fear, he added. Later the chief guest also released a book titled “Compendium of Finger Print equipment 2018”.